"She painted others, but her main subject was herself. She was invaded by her own sickness and what she saw was herself." One of the great artists of the 20th century was Frida Kahlo, recently memorialized in the Julie Taymor biopic starring Salma Hayek. This debut documentary from Amy Stechler (ex-wife of Ken Burns and editor on Burns' Huey Long and Brooklyn Bridge documentaries) fits firmly into the family mold and is of similarly high quality. Kahlo, born in 1907 near Mexico City, lived a life of emotional and physical pain. The daughter of a photographer, she turned to painting as she attempted to recover from a horrific bus accident that broke her spine and pelvis and crushed her right leg. Like Beethoven, she found depth of artistry through introspection, obsessively painting self-portraits that frequently ventured into the weird and surreal in nature. Her emotional state comes through the paintings as various things, both good and bad happen to her over the course of her life. One of the great influences on Kahlo was her on-and-off relationship with the muralist Diego Rivera. United by art, they were something of an odd couple; he was six feet tall and weighed 300 pounds, while she was tiny, weighing only a third of that. Despite a deep emotional affinity, Rivera found himself unable to be faithful, resulting in heartache and unhappiness for them both, especially when he took up with Frida's sister Cristina. The documentary does a good job of portraying their struggles, and their turbulent relationship as it was expressed through their creativity. As usual for a Burns-style documentary, there are plenty of talking heads commenting on the principals interspersed with photos and silent footage of Kahlo and Rivera. Since she died only about fifty years ago, numerous people who knew Kahlo are still alive to comment on their recollections of her, making this film a valuable document as well as a documentary. Rita Moreno contributes a sensitive narration, while Lila Downs reads from Kahlo's writings. The film touches on the artist's romantic relationships both with men and women, though it generally does so tastefully. Most importantly, a wide array of Kahlo's paintings are seen, and they're well reproduced. For a first directorial effort, this is quite a fine one, and I look forward to more documentaries from Stechler. Image Transfer Review: The full-frame picture looks quite fine, as it should for a 2004 production. Colors are vivid, as is detail. As mentioned above, the paintings themselves reproduce quite nicely, with very little aliasing or other artifacts to detract from examination of the images. Audio Transfer Review: The 2.0 audio tracks are quite clean. The Mexican guitar music throughout has suitable presence without being overbearing. Hiss and noise are practically nonexistent. Extras Review: The sole extra is almost 24 minutes of additional interview footage with three of Kahlo's four longtime students. They reminisce about her teaching techniques and philosophies of art, as well as personal anecdotes. It's in these interviews that Kahlo really comes alive, and they make an excellent supplement to the biographical narrative, though they probably would have been too much of a tangent to be incorporated into the program proper. 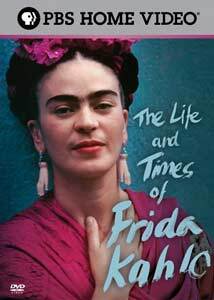 An intense and probing look at the real life of Frida Kahlo, with some excellent bonus interview footage. Well worth checking out for anyone interested in the artist's dramatic life.